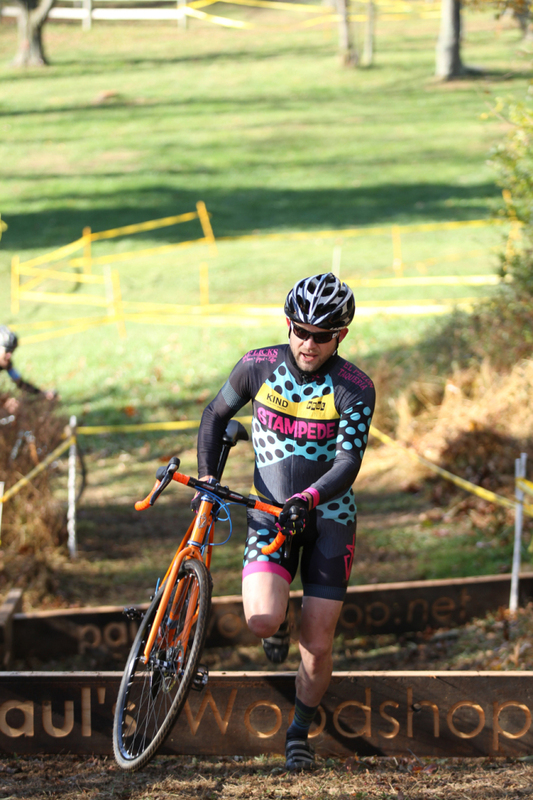 This entry was posted in Events and Occurrences and tagged 2014 cross cyclocross fair hill s-works salsa stampede on November 12, 2014 by Stefan. 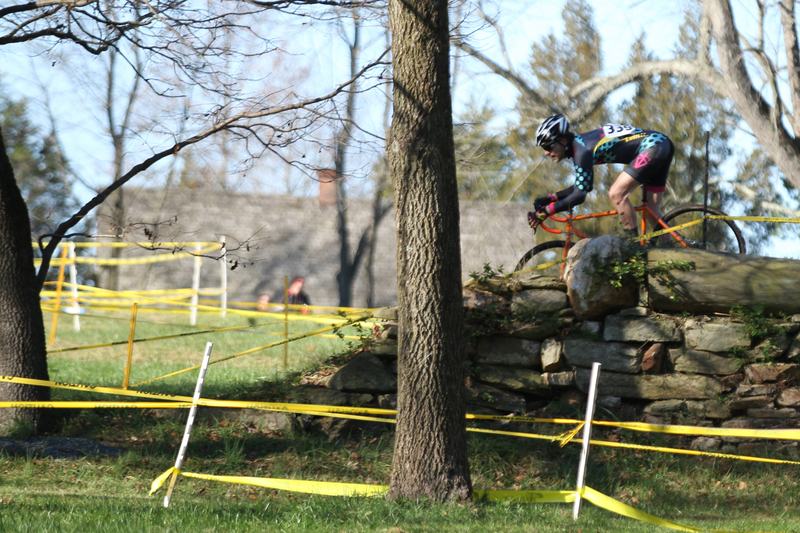 The First State Velo Sport Fair Hill Xross is #9 in the Mid-Atlantic Cyclocross championship. It is less than a 30 minute drive from home, just a little over the line into Maryland. Except for Granogue, this is as close as it gets for us and we’re thankful for being able to get up with the sun this morning. 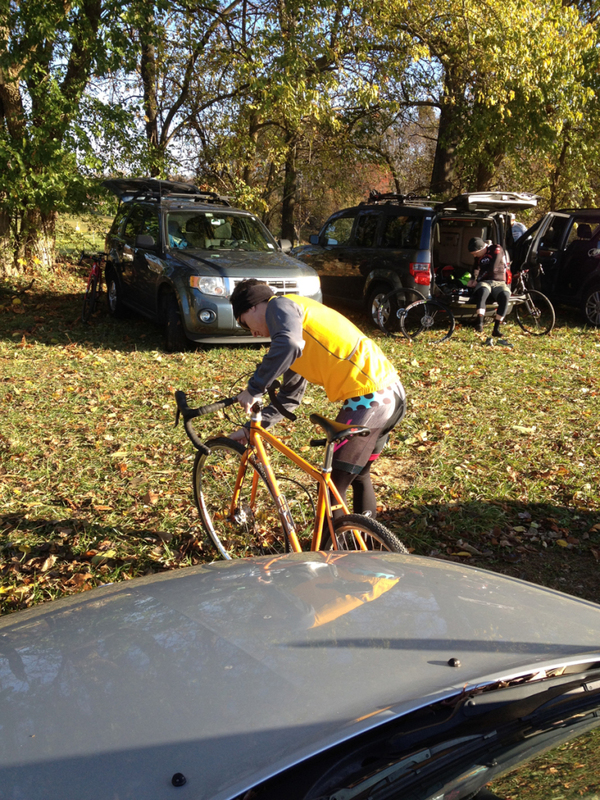 Chris was sick all last week (missing Swashbuckler Cross because of it) and is only *just* back on the bike. While my goal is to continue my trend of moving up in the results, his is mostly to survive the effort and continue to finish not last. No matter, it is great to have my friend and teammate back in the race with me. I’ll finally get a pro pinning job done on my bib number again! There was some rain during the week, but it is dry today and the course is in fine shape. Some low areas still retain enough moisture that your wheels sink into the grass, making ruts and a draggy spot, but everything is manageable. I’m called up to my starting spot in the 3rd row and Chris lines up directly behind me in the 4th. It is a dirt-road uphill start. The whistle blows and the pack moves off as a wobbly mass. There’s no room to break out as we negotiate a soft spot on the road but shortly after I move into a gap and up a couple of spots. Going through the first turn, I try to migrate to the opposite side of the course so that I can be on the inside for the next few turns. I’m halfway there but find myself overlapping wheels with the two guys in front of me. The gap starts to close and it looks like a recipe for early disaster so I punch the pedals until I can get my elbow up to his hip and make myself a little room. We lean on each other through the turn and then exchange pleasantries about how we’re both just trying to stay upright. No damage done as it worked out for both of us. My intention is to hang onto the top 10 riders but I can see I’m not quite there yet. I dig in and try to work forward. I’m not making up much ground until we get to some of the first off-camber stuff. Here I use a more difficult high-and-tight line to flow past those on the easier low line. Shortly after this, the course becomes what I refer to as “ditch-cross”. There’s this drainage ditch and the course runs into, across, out, and back down into it again, again, and again. After this, I’m up to 10th! Turning up out of the ditch. Escaping the ditch I see another opportunity to make up some ground on the trickiest section of off-camber riding. I go for my high line again but my rear tire gets loose. It slides out wildly but I unclick my high-side foot in time to dab. Then it finally grabs some traction and PFFOOOOSH! It takes me only an instant to verify that yes, I just “burped” my rear Michelin. I seem to have about 10 PSI left. It is enough to ride, but not enough to race. Fortunately, I’m just yards from the pits and I have my pit bike waiting (this lesson having been learned the hard way at the beginning of my season). I arrive in the pits and am thrilled to see “Chappy” from the DCCoD (Delaware Cross Coalition of Delaware) standing there. If he has a pump, I’m saved. So, we work out a quick arrangement where he will go find a pump, put 40 PSI in my rear tire, and I will swing back by on the next lap. Tossing him a profusion of thanks, I grab my mountain bike and head off after the pack. I’m probably a bit full on adrenaline right now, as I’m really not losing any ground riding my mountain bike. Honestly, it is doing really well here. This is my old-school Specialized S-Works CroMo, still set up the same way I rode it back in the early 90’s and it actually weighs less than my cyclocross bike so maybe I shouldn’t be surprised. Chris raced by me when I was in the pits but now I can see him a few turns ahead of me so I’ve got someone to reach for. I get near to him up the first set of barriers, which are on a steep uphill of that sort of mud that packs into the cleats of your shoes. The barriers are lovely, made of reclaimed wood and engraved with “Paul’s Woodshop” on their sides. Later in this race I suspected that my feelings for Paul’s Woodshop would be somewhat more embattled. Chris is riding well so I’m hanging behind him for a while, enjoying the teammate thing. I’m tuning into the S-Works and we’re rolling down a twisty section when the guy in front of us slows a little and forces Chris to check-up. I don’t see it coming and overlap my front wheel on Chris’s rear! “Brztdzrpzbtzrdzp” go the tires as they rub together, my mountain bike tread against Chris’s cross tread, and “thud“, I’m on the ground! I’m back up and on my bike so quickly I might have bounced there. There’s a clod of earth in my left pedal, another in the buckle of my shoe, and a mini-clod jammed under my handlebar grip. None of it is hindering function however, and I race back to the other side of the pits to see Chappy standing there with the La Cruz pumped up and pointing at the exit. SO PRO! I angle into the pits and Chappy grabs the riderless S-Works while letting go of the La Cruz in one smooth totally pro bike change. 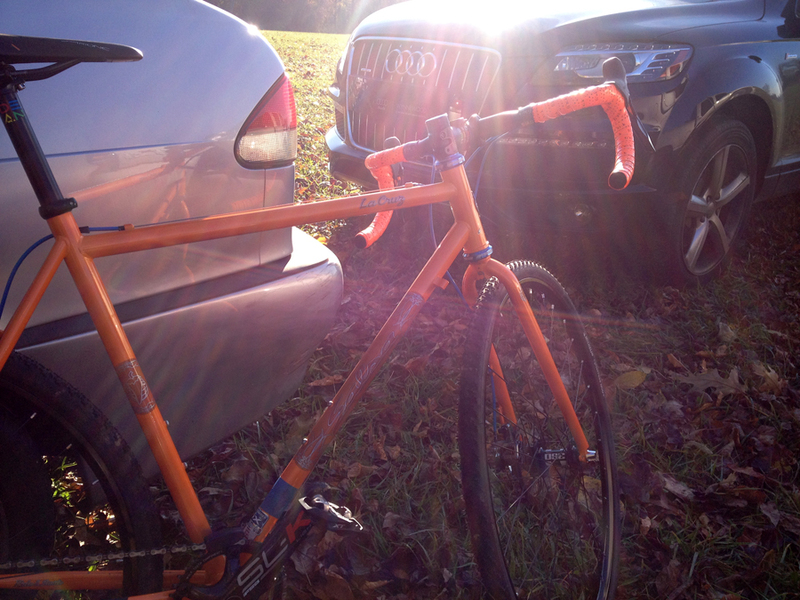 Hardly even a second lost, I’m back on the cross bike after just half a lap on the S-Works. The rear tire feels firm and I wonder to myself if the gauge on my quarter-century old Zefal floor pump is reading correctly? I had to change my bike twice! At this point I really have no idea where I stand in the order of things but the basics of it are simple enough and the same no matter how you say it. Go as fast as I can. Hold nothing in reserve. Leave it all on the course. Rolling over a fun obstacle. I’m enjoying the fight but running out of laps. It’s the last one now, and I’m aiming for a guy just ahead of me as we go by the pits. He’s been just out of reach for ½ a lap but I’ve caught him up the hill (a rare occurrence considering my riding style) and pass him at the turnaround so that I can lead going over the last set of barriers. I look back as we turn onto the gravel road that leads onto the finishing straight and I have about five bike lengths on him. 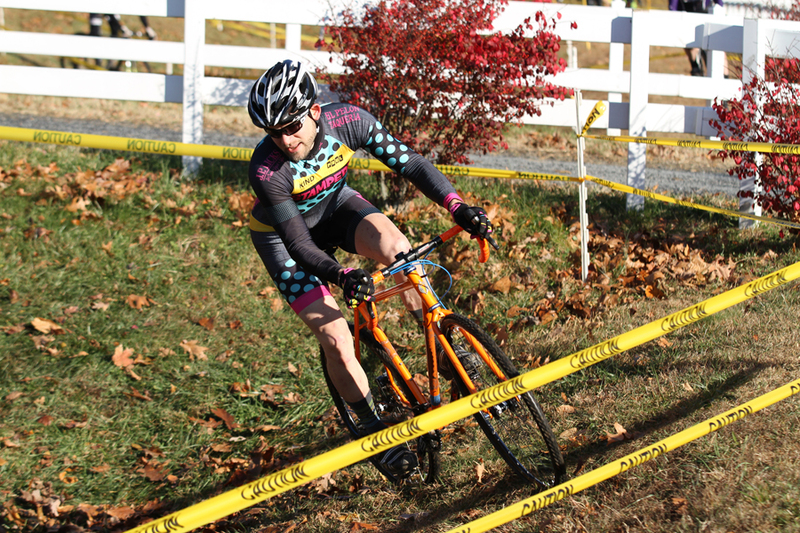 I don’t let up, but pedal hard on the finish straight until I reach the announcer’s stand. Thinking I’m done, I start to soft-pedal. However, the finish line isn’t at the announcer’s stand. It is another 20 yards up the road. I hear tires over my right shoulder and realize my stupid stupid stupid mistake as he goes by me. I jump out of the saddle and sprint as hard as I can, actually closing the gap back, but it is all too late. I lost my spot and can’t do anything but roll to a wobbly stop, collapse over my handlebar, and congratulate that guy on a smart(er) race. I finish 13th. 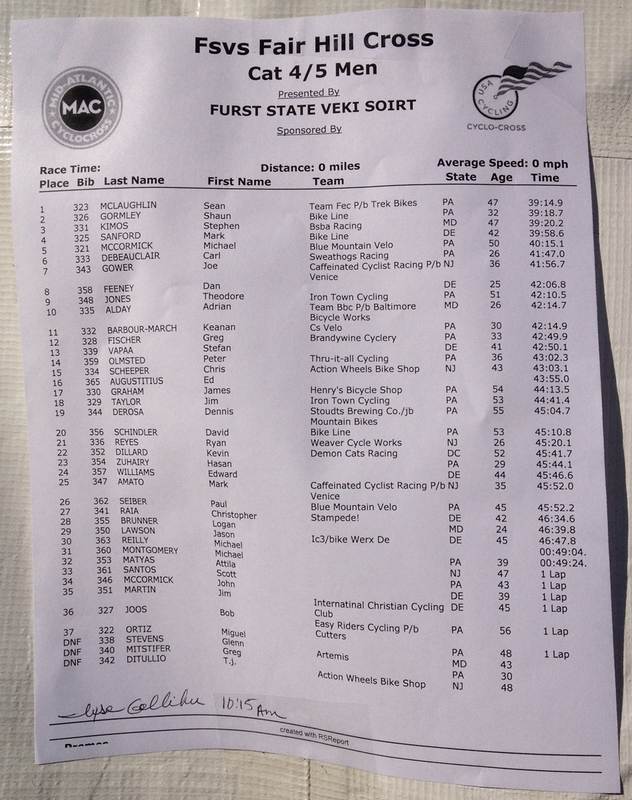 All told, not bad considering I lost about 60 seconds to the burped tire and bike changes. 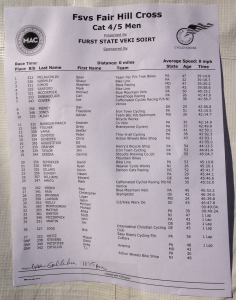 But if I look at the results sheet it is frustrating to see where I might have been fighting without that “mechanical”. It is doubly frustrating when I realize I owed myself 12th place, but for a embarrassingly rookie move. Chris finished shortly thereafter, in a respectable 27th, having made a brave go of it with a body that was still recovering from more than a week of “flu-like” symptoms. I learned some new lessons in this race. Failures tend to do that to you. If you don’t want to ride your B-bike for a whole race, put tools (and a mechanic) in the pits. It’s OK if you crash into your teammate, so long as YOU go down and not him. Always look back and never assume the fight is over, until it is. Actually, I already knew that last one. I just didn’t do it.